Please see Full Prescribing Information for Gadavist® (Vials & Syringes). 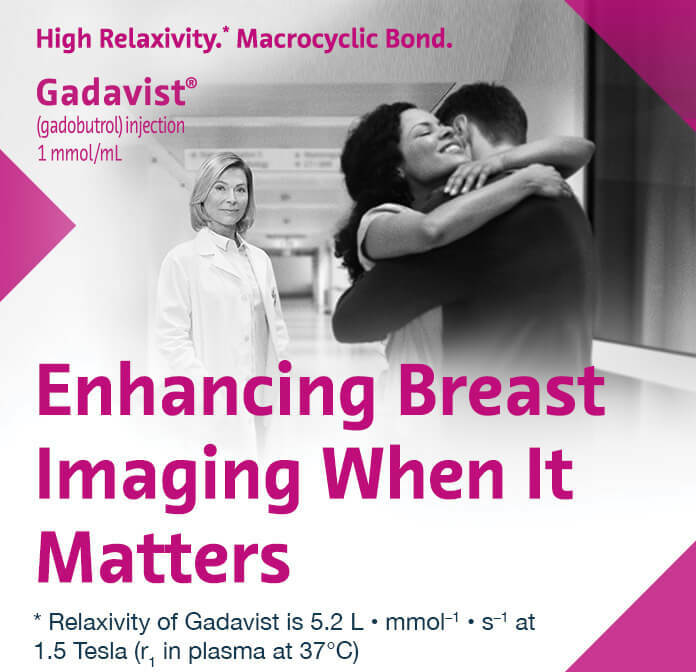 Please see Full Prescribing Information for Gadavist® (Pharmacy Bulk Package). References: 1. American College of Radiology. ACR Practice Parameter for the Performance of Contrast-enhanced Magnetic Resonance Imaging (MRI) of the Breast. https://www.acr.org/-/media/ACR/Files/Practice-Parameters/mr-contrast-breast.pdf. Accessed August 28, 2018. Bayer reserves the right to modify the specifications and features described herein or to discontinue any product or service identified in this publication at any time without prior notice or obligation. Please contact your authorized Bayer representative for the most current information. Bayer, the Bayer Cross, and Gadavist are trademarks owned by and/or registered to Bayer in the U.S. and/or other countries. distributed without the express prior written consent of Bayer. 100 Bayer Boulevard, P.O. Box 915, Whippany, NJ 07981.